Ruby’s Franchise Systems, Inc, the creator of Ruby’s Diner and America’s favorite burgers, fries and shakes, today announced the continued expansion of the company’s unique non-traditional store concepts in key U.S. growth markets. Two new franchise locations are set to open in November 2016 including Ruby’s Diner Concession Kiosk at Valley View Casino Center in Point Loma, California and Ruby’s Express at Outlets at Anthem in Phoenix, Arizona. Ruby’s Franchise Systems, Inc plans to open additional locations through the end of the year, with three new Ruby’s Diners slated to open in Southern California in December 2016. With 34 years of experience, Ruby’s Franchise Systems, Inc continues to expand its presence outside of the stand-alone diner concept and into non-traditional venues including airports, malls and casinos. With the addition of the two new locations, the brand’s portfolio now includes 32 Ruby’s Diner concepts across the country with plans to expand into the international market in 2017. Officially opening November 17, a Ruby’s Diner concessions kiosk at Valley View Casino Center marks the fourth San Diego location for the brand. The Ruby’s Express at Outlets at Anthem will be the first Ruby’s concept in the Arizona market for the group. Ruby’s Restaurant Group operates and franchises Ruby’s Diner concepts. Celebrating 35 years of success in 2017, Ruby’s Diner first opened on the Balboa Pier in Newport Beach, California in 1982. Today Ruby’s Restaurant Group is a privately held company that operates and franchises multiple Ruby’s Diner concepts across the nation. 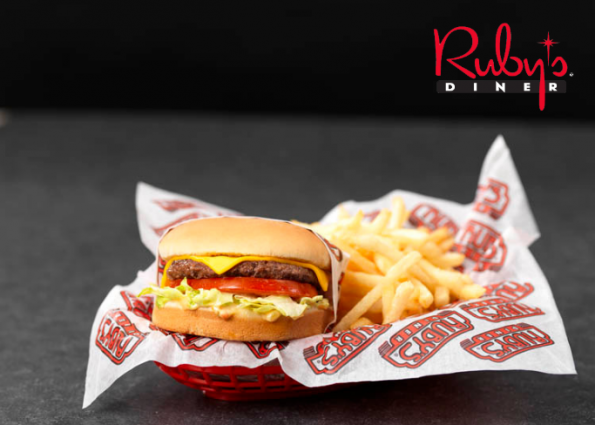 With over 32 U.S. stores across California, Nevada and Texas, including mall, casino and airport locations, Ruby’s Diner serves up America’s favorite burgers, hand-made milkshakes, and delicious fries in addition to a wide selection of breakfast entrees. Shooby Dooby down to Ruby’s online at Rubys.com and stay connected for company news and updates on Facebook, Instagram, and Twitter.